Nestled between the Gulf of Papagayo and the sapphire blue waters of Culebra Bay, this luxury resort personifies Costa Rica's Pura Vida (pure life) expression, an extension of the native spirit of the country. Guest rooms and suites balance modern design with touches of character that blend into the natural surroundings, highlighting Costa Rican aesthetic and featuring breathtaking ocean views. 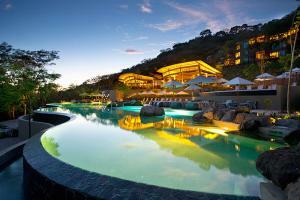 Located on between the Gulf of Papagayo and the sapphire waters of Culebro Bay in Guanacaste, Costa Rica.